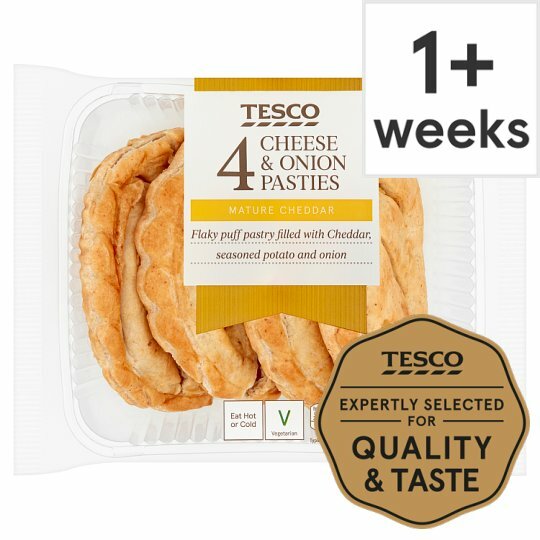 A light puff pastry filled with a blend of potato, cheese and onion. Potato, Wheat Flour (Wheat Flour, Calcium Carbonate, Iron, Niacin, Thiamin), Mature Cheddar Cheese (Milk) (14%), Palm Oil, Onion (10%), Pasteurised Egg, Water, Coloured Mild Cheddar Cheese (with colour: Annatto) (Milk) (3%), Cornflour, Rapeseed Oil, Potato Starch, Salt, Egg White, Mustard Seed, Whole Milk, Spirit Vinegar, White Pepper. Remove all packaging.Can be eaten hot or cold. Suitable for home freezing. Ideally freeze as soon as possible after purchase but always by 'use by' date shown. Use within 1 month.